Becoming a parent is hard. Or, rather, it's a lot different than how life was before. Before, so much of my time was spent worrying about myself and what I wanted to do. And, if you don't remember from a long long time ago, I'm a counter. It's hard for me to not look at what I'm doing and what other people are doing to make sure that I'm getting my fair share. I think that this is partially because I'm a middle child, if I didn't worry about my fair share, then no one else was going to worry about it for me! In case you were wondering, that doesn't work so well when it comes to parenting. It's a very quick way to jump from happy parenting to resentment toward your partner. So, my best piece of parenting advice that I got was to not take turns. This applies to a lot of areas of life, but specifically, I'll talk about parenting and marriage. When we first had Everly and she was in the NICU, I couldn't walk. This meant that Brian took care of her a lot more than I did those first few days. He fed her and changed her and did whatever she needed. Not only that but I needed a lot of care those days. I needed help to the bathroom. I needed help getting back in bed. I couldn't even put my underwear back on by myself. He happily and selflessly helped me with all of these things while taking care of the baby. Then when we came home and things settled down, Brian went back to work. That meant I was taking care of the baby. I was feeding her, changing her, doing whatever she needed. Brian would help out when he came home, but it wasn't then "his turn" to take care of her. Then we both took care of her. The beauty of this is that everyone gets taken care of, as long as both parties are actively working on it. I don't worry if Brian changes Everly a few times in a row, or if I change her while he's home. We help each other out where we can. Instead of, you versus me, it becomes us working together. I'll admit that there were a few times where I thought about it. I let the counter in me sneak in and start to tally up how I was doing more for her. Then I remembered that he's going to work to support us both. I started to count how many hours he got to go running or that he got to go out with friends. Then I remembered that he would stay up for the first feeding of the night with her so I could sleep. I remembered that he gave me Wednesday nights for self-care and time to just be Rachael instead of Mom. Because it's never just about my turn or his turn, I know that I can ask for help when I need it and he'll happily give it without shooting back "but it's your turn" or "I just did that". It makes me feel so much more supported, which in turn helps me to feel like I want to do more for Brian than I would. It turns me to looking outward instead of counting all the things I've given up. It keeps the balance from shifting too heavily to one side. 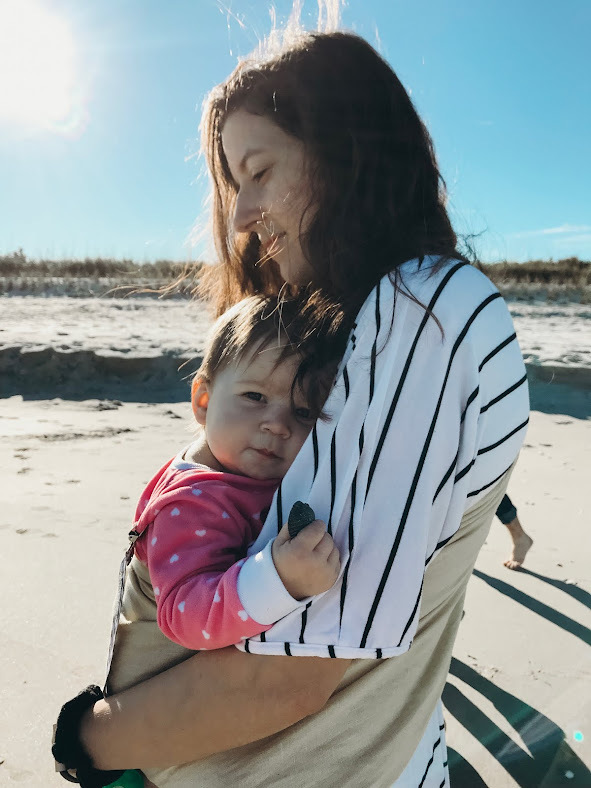 My mom commented on this a month or so after we had Everly and I realized that even though it was something that we'd implemented into our parenting, it was something that we had implemented into our marriage first. Somehow without ever talking about it, we managed to put that into practice. We both cook dinner sometimes, we both clean up, we both put away the laundry. It isn't about "this is my job and that's your job" we recognize that our life is both of ours to take care of. Sometimes I can do more, sometimes he can, and honestly, sometimes neither of us has the energy to do something, like cooking or cleaning up, but because we're both on the same team, there isn't any blame placed if those things slide for a day or two. The most important thing that not taking turns has taught me is that we're in this whole experience of marriage and life together. It's so much nicer that way, and when you're being taken care of that way, then you, in turn, have more to give. 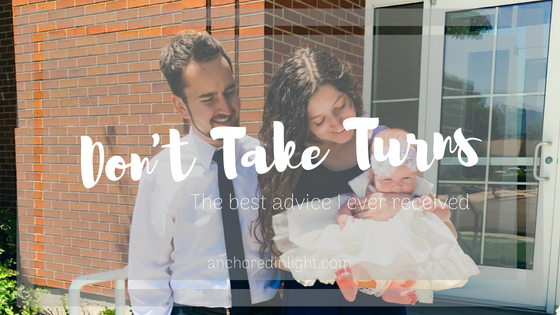 What's the best parenting/marriage advice you've been given? Do you take turns?